Well, it took 3 months but the chrome robroe pickup covers finally arrived. Now the guitar looks like a proper Mustang. The covers are just painted plastic. They look good now, but I have a feeling the "chrome" will quickly wear off. Anybody know if it's possible to buy actual metal mustang pickup covers anywhere? I've had no luck finding any online. By the way, anybody know why the picture is upside down on the forum? It's hosted on my flickr account, where it is right side up. Why would you not just use black covers? It looks great btw! Thanks! I think proper chromed metal Mustang covers would look cool, it's purely for the cosmetics. Besides, I've already installed white switches and knobs... that would look weird with black robroe covers. The knobs would be easy enough to change to black but changing the switch colours would require the headache of resoldering a whole bunch of wires. I thought of putting green covers and knobs at one point, but I've never seen green mustang switches though. I think that all that green plastic might look too garish, so i decided against going that route. I've never seen the chrome covers before, even painted ones. its a pretty sweet option. depending upon what is under the paint they might end up looking really cool after worn down a bit. 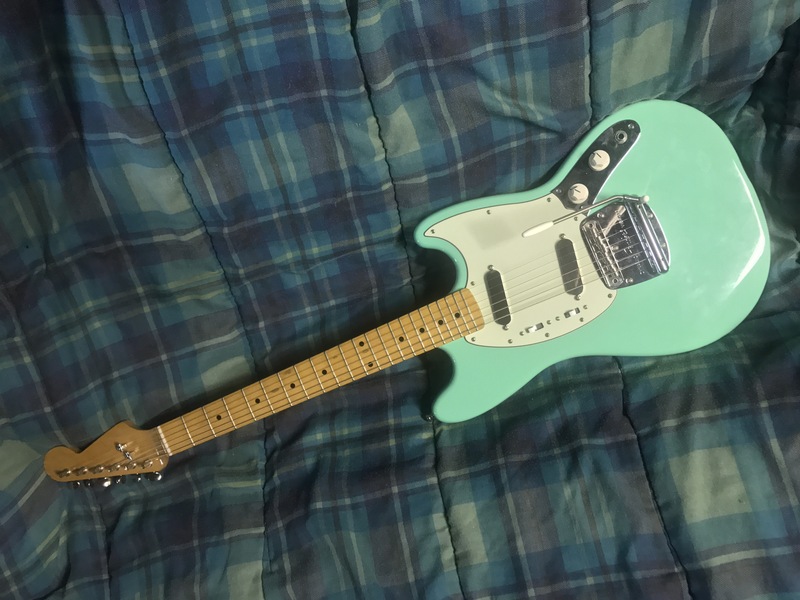 I found the covers on eBay, there are chinese sellers that have mustang covers in just about any colour imaginable, same with mustang/jaguar/jazz bass knobs. They're cheap, too, but shipping takes 2 or 3 months to get to Canada. I'm hoping the wear will look good if and when it happens, hopefully the plastic under the paint is not some obnoxious colour! Still holding out hope that I'll find proper metal covers. I am amazed that there don"t seem to be any anywhere... surely I can"t be the only guy who wants these? Even standard strat covers made of metal are almost non-existent. Wouldn't metal covers help shield a single coil from hum? It looks cool, but from your photo I thought those were black covers and not chrome. Black would look great and somehow kind of seventies, which is how this whole thing looks. I too am waiting for my Mustang from Warmoth. Should hopefully arrive in a week or two, then it's time for assembly.